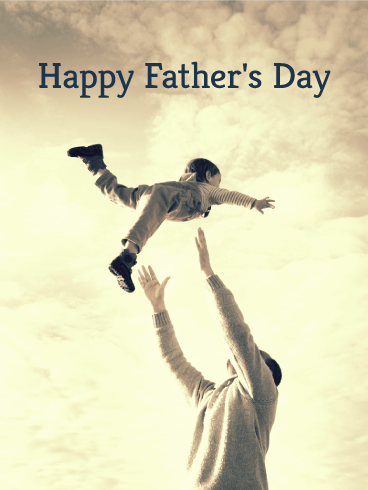 Father's Day celebrates real-life heroes. 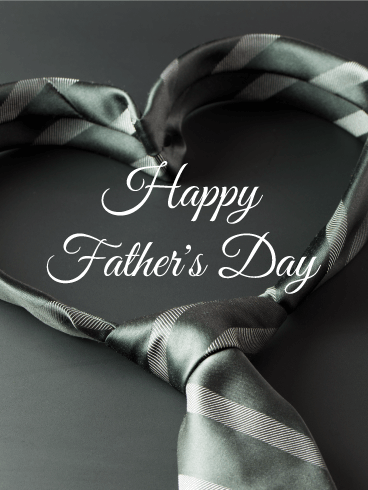 No one is more inspiring or important in your life than your dad, so why not tell him so? 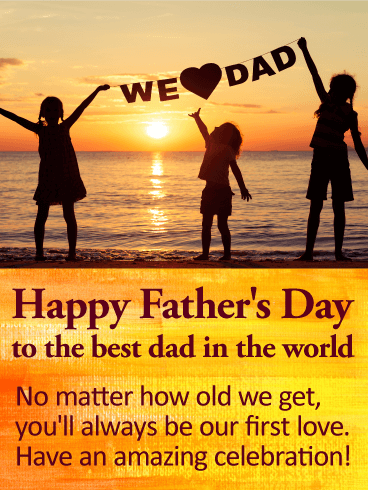 Send your dad a meaningful Father's Day card and message to warm his heart and brighten his day. 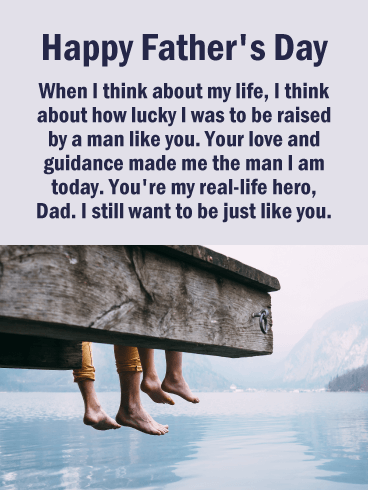 If your dad is your hero and role-model, this Father's Day greeting card is perfect for the loyal son to send! Amazing, terrific, what a champ! Your dad is amazing! 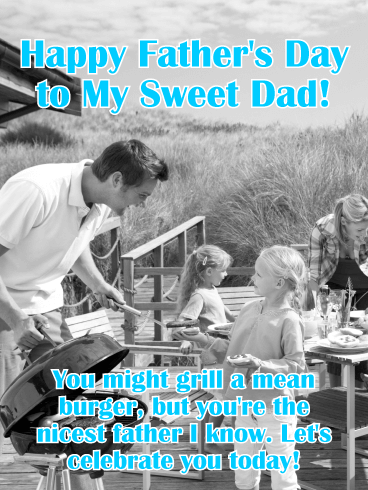 If your dad's favorite sport and way to relax is a round of golf, send him this hole-in-one Father's Day card today. 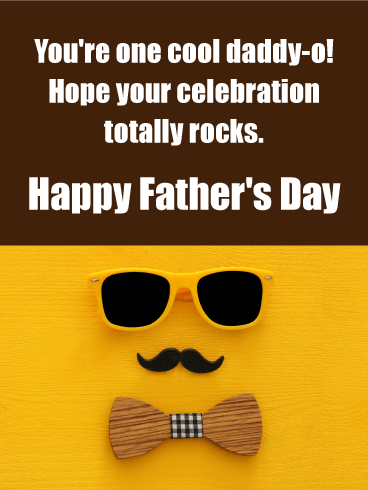 Celebrate the awesomeness that is your Father by sending a fantastic Father's Day greeting card to him. 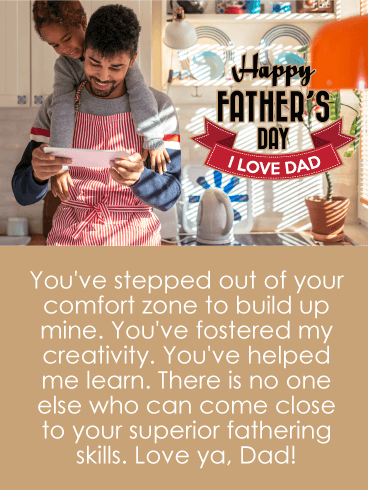 This Father's Day card is a super fun and super simple way to let your dad know how proud you are of him! Golf is a game of patience and focus-kind of like fatherhood! 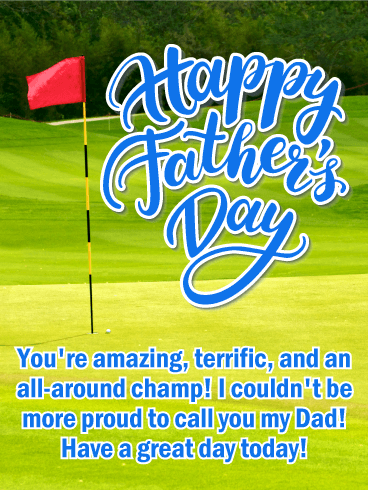 Wish your dad a happy Father's Day this year with a golfing Father's Day card. 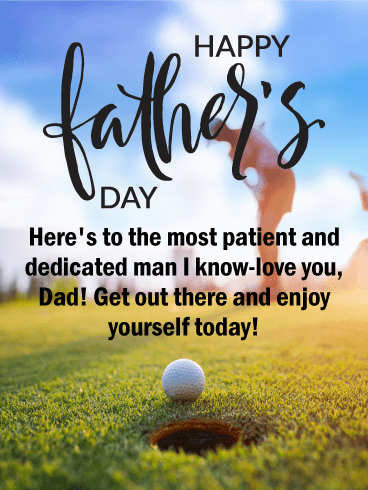 Honor your dad’s dedication and patience and tell him how much you love him with this hole-in-one Father's Day greeting card. There's nothing like a day on the greens! 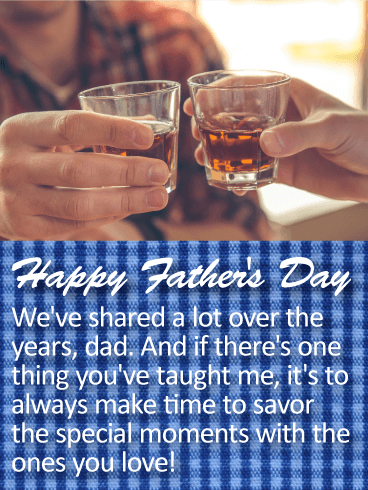 This Father's Day card is a reminder for your dad to get out there and enjoy what he loves most on this special day. 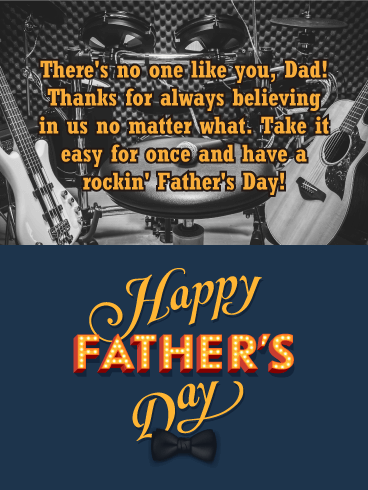 Here's a rockin' Father's Day greeting card for a cool Dad who's always been there for you. 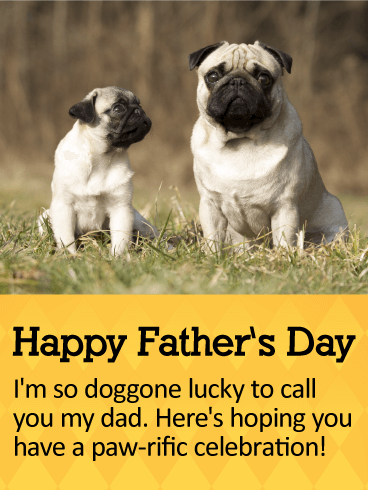 This card 'from all of us' lets you send your pops a thoughtful Father's Day card from the whole family. Does your Dad like music or play music? 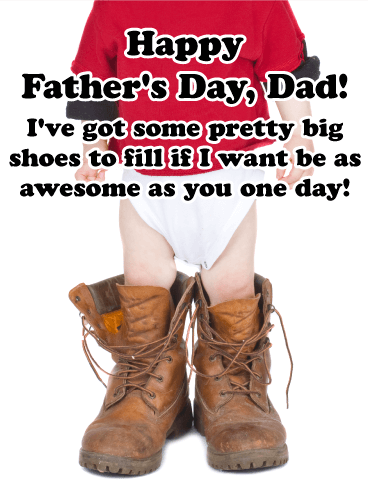 Then this Father's Day greeting card could be just the ticket to make his day even more fun! Fathers teach us a lot of good things like how to be responsible with our money and to respect our elders, but they also teach us not to worry so much! 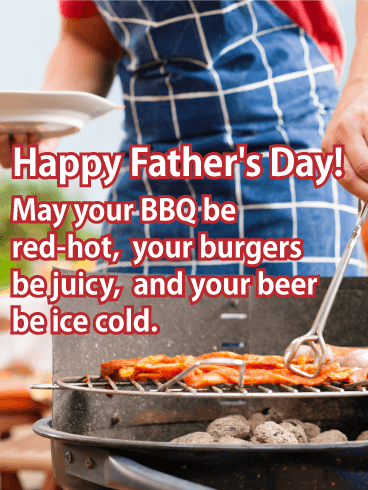 If your Dad is the kind of guy who always knows how to enjoy the day and live in the moment, this Father's Day card is for him! 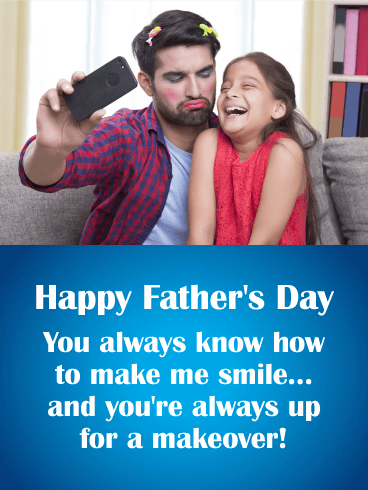 Send this Father's Day greeting card from the whole family. 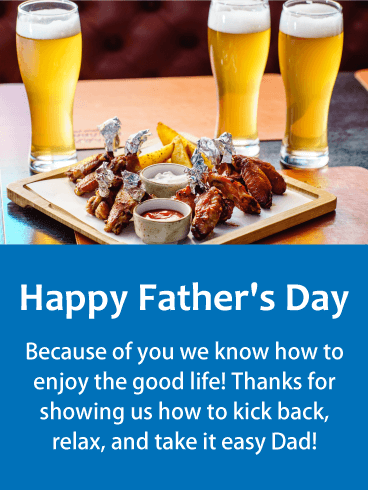 Beer, wings, and fries-what couldn't be a better way to celebrate Father's Day? 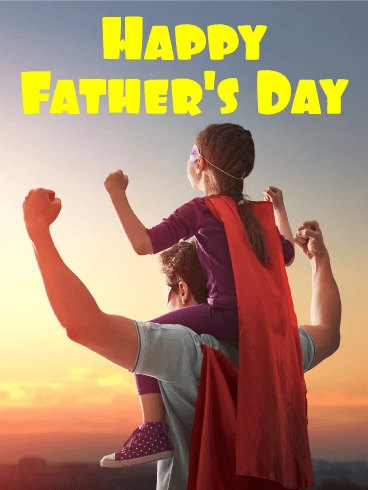 Is your Dad a superhero? Can he fix the toilet and grill the most amazing hamburger? 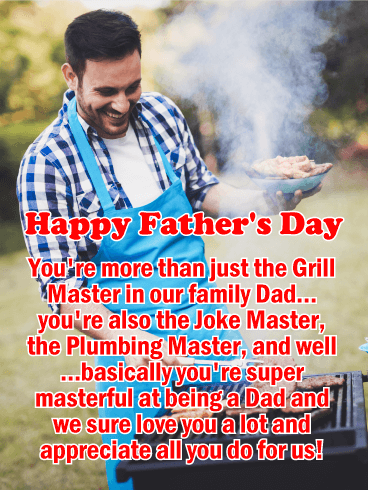 Give credit where credit is due and send your Dad this hilarious Father's Day card that is spot on! He does a lot for the whole family to keep it functioning! 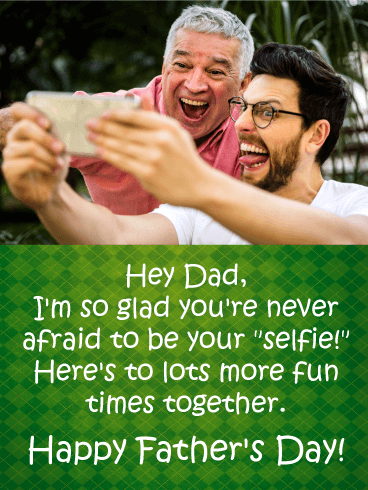 Tell your Dad you love him with a fun Father's Day greeting card to remind him of the very important place he holds in the family. 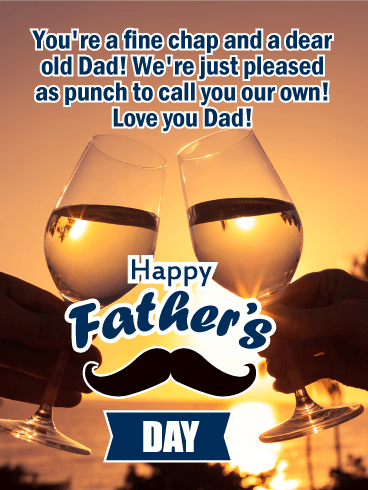 I 'moustache' you a question: Is your Dad a fine chap, a swell guy, a proper bloke? Well my dear friend, here is a very silly and sophisticated card for you! 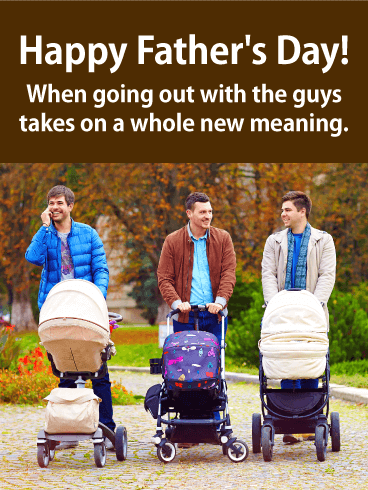 Send this fun Father's Day greeting card to your Dad from all of you and give him a giggle. 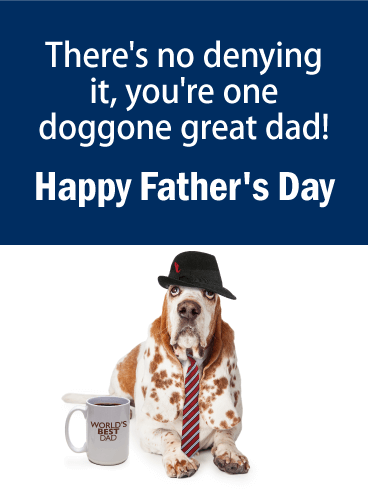 Dads like to know they are loved but don't need any card that is too serious! 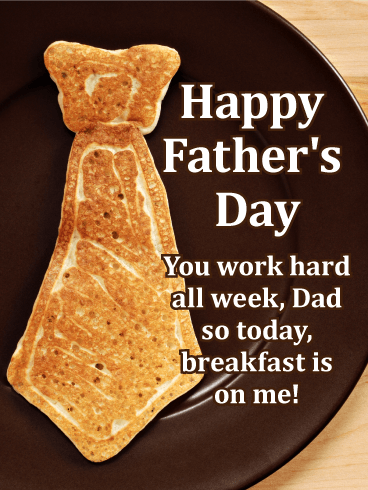 That's why this Father's Day card is just perfect! 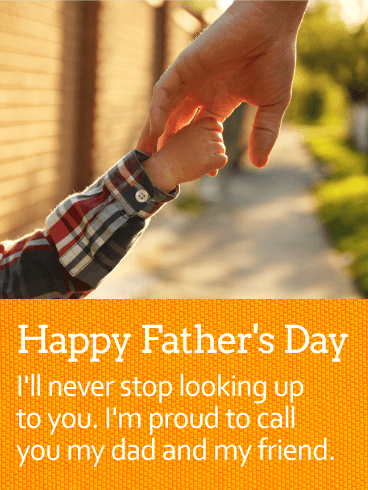 This heartfelt Father's Day card let you say thanks to the amazing man you call dad. 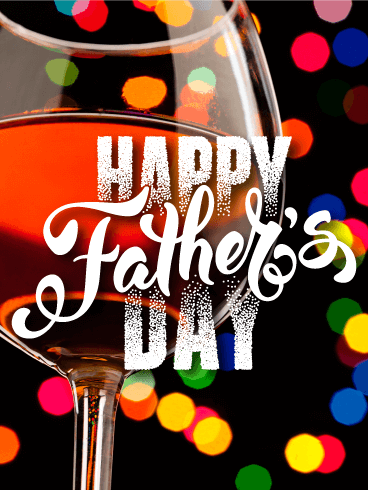 The image of a grown son ready to share a special toast with his father sets the tone for the touching message below, which speaks to why life's captured moments are so important. It's a chance to sit back and savor a moment together, to reminisce and to remind him why he'll always be the person you look up to most. 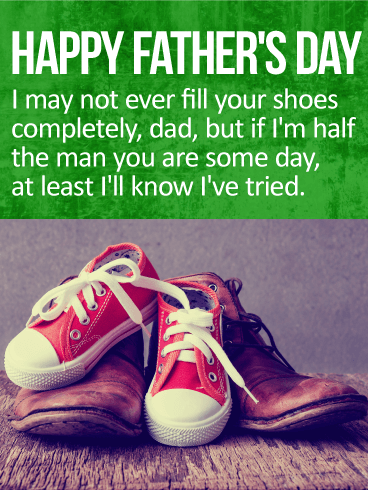 This heartwarming Father's Day card shows the image of two pairs of shoes: one, a worn pair of brown work shoes; the other a pair of bright red and white sneakers. One sits on top of the other, as a gentle reminder that while you may never fill his shoes, if you're able to come close, that's all that matters. 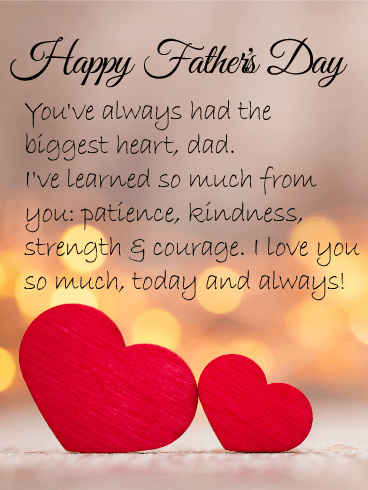 Whether you have kids of your own or not, this touching greeting from a son to his dad will make him feel loved and remembered not just today, but all throughout the year. 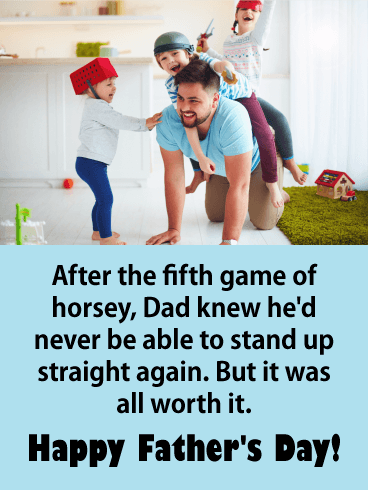 For all the love Dad has shown you over the years- staying up with you when you were scared, cheering you on from the sidelines, teaching you valuable life lessons-let him know how much it means to you with this touching Father's Day card. A pair of hearts, big and small, sit side by side, while twinkling lights glitter in the background. What a beautiful image to accompany the heartwarming message above. 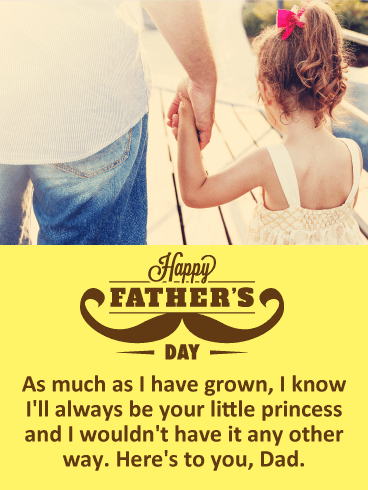 Whether you're young or old, near or far, this sentimental greeting is guaranteed to make him feel special. 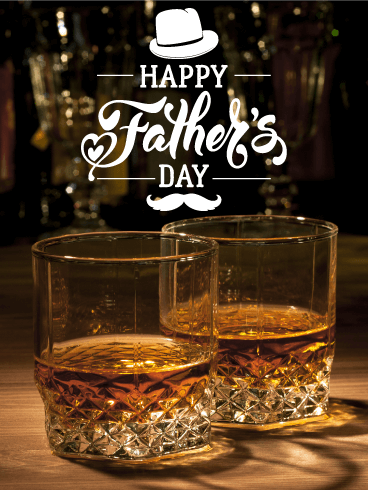 Both sharp and sophisticated, this Father's Day card was designed to make dad feel remembered as he celebrates his special day. Two glasses sit side by side-yours and his-ready to be savored over some long conversation and lots of laughs. 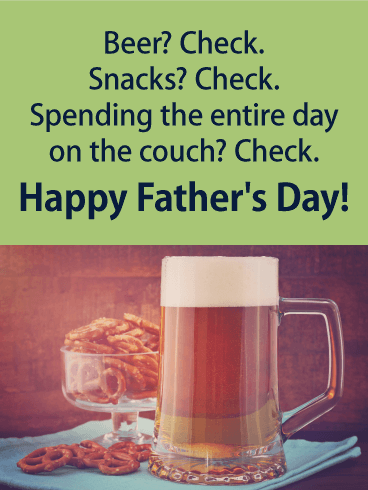 Below, shades of brown and beige form a classic argyle print, adding to the character of this cool greeting, while in front "Happy Father's Day" is spelled out big and bold as a way to show just how much you love and respect him, today and always. Your Dad and you share a special bond. You were the apple of his eye as you grew to adulthood. Even now, there is just something about picking up and calling Dad that automatically makes you feel better. 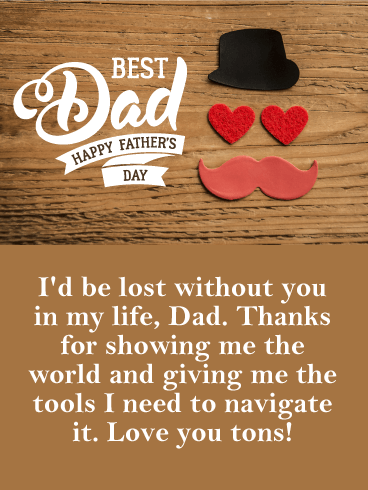 So let him know how much that bond means to you this Father's Day with this touching Father and Son card!